How do cultural traditions, practices and social interactions challenge transnational influences in ways that contribute to community self-determination? This collection of papers examines a variety of Andean social contexts and relevant issues – the school house, rural health system, protection of agrobiodiversity and the environment – to explore strategies generated that reinforce cultural revitalization and continuity while responding to effects of globalization at local levels. Presenters participated in the Center for Social Well Being’s field school that emphasizes community participatory action research, and is located in the Cordillera Blanca mountain range of the Callejón de Huaylas, Peru. How does the environment influence people’s schemes and the way they understand their world? This paper examines those characteristics of the environment that seem to shape several aspects of people’s lives. As there are bilateral interactions between organisms and their environment, we have proposed that certain characteristics of the environment that are more salient than others are going to play a fundamental role in shaping people’s cognitive systems and therefore the way people interact with their environment. The place chosen to develop and investigate these ideas further was the Callejón de Huaylas, Perú. In the Andean valley of Callejón de Huaylas, I was involved in an ethnographic field school that provided a glimpse into a society that is struggling to keep up with the ever changing and destructive forces of modernity. While living in the Andean hamlet of Cajamarquilla, I was exposed to Andean sustainable living and how municipal authorities desperately need cooperation from the Peruvian government, private agencies, and the local community. My experiences and research will provide knowledge into the world of Andean sustainable living, waste management, and composting. I will demonstrate how the recycling and composting system of Carhuaz works, while pointing out its strengths and weaknesses. Current social conditions of the Peruvian Andeans are influenced heavily by the international economic system. Because of structural adjustment policies, the Peruvian government has cut funding for health care, education, and environmental protection, so people are left with little choice but to organize and cooperate with one another to provide these necessary services themselves. 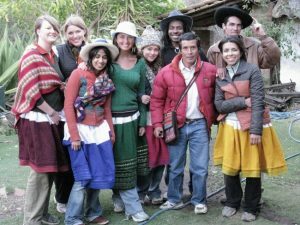 This paper attempts to situate the local Andean experience in the context of the national and international constraints and opportunities drawing primarily on the authors time enrolled in a field school in the Callejon De Huaylas. Local and state efforts to educate Peruvians about environmental sustainability have manifested in the local schoolhouse as environmental education. In order to examine student understanding of this education (and determine the effectiveness of this type of outreach), I conducted a drawing activity with youth from two rural schools. This paper will discuss the resulting data gathered from youth drawings, the use of children’s drawings as a participatory method, and how local efforts in Peru can be compared with attempts in the United States and elsewhere to increase environmental stewardship through youth education. This presentation will focus on the retention of cultural values in the setting of a rural school house in the Andean hamlet of Cajamarquilla. I explore how classroom curriculum, activities and responsibilities both contribute to and draw out a sense of meaning and purpose among the youth. Using information gathered from observations of classroom activities and interactions as well as participatory action research exercises conducted among the youth, this analysis will examine the identification, recognition and revitalization of local cultural values, in addition to the objectives and ideals that emerge in the face of globalization.